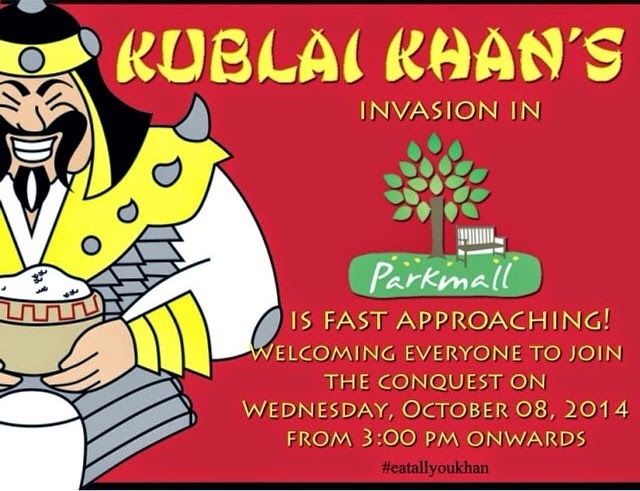 Barocan Ventures Inc. in partnership with Amuse Foods Inc. is happy to announce the opening of Kublai Khan Eat-all-You-Can Restaurant Parkmall branch. 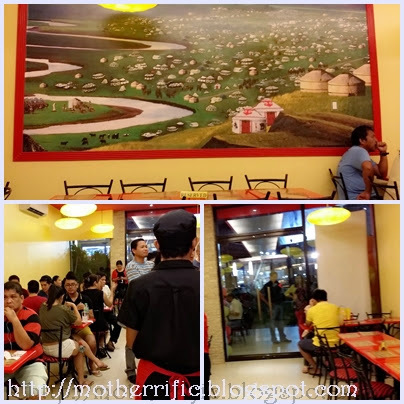 Although the first Kublai Khan Restaurant opened at Gaisano Country Mall way back March 1999. I must admit that I'm not such a huge fan of Mongolian cuisine. 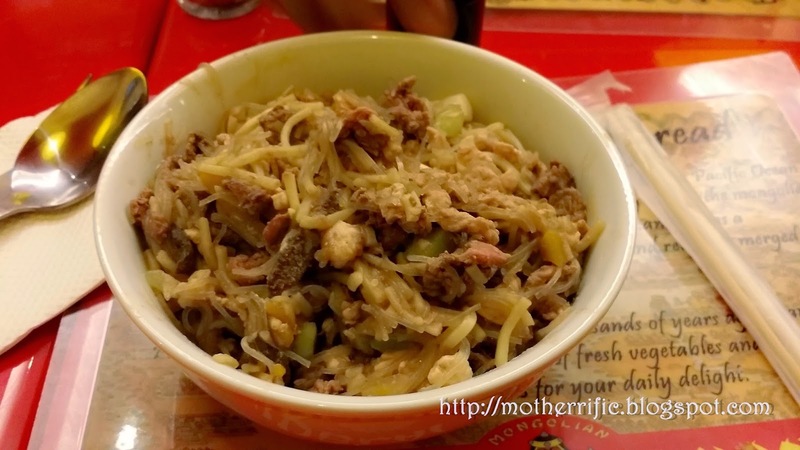 When I got invited to their branch opening last October 8, I told myself it's time to explore my hidden gastronomic cravings for Mongolian food. 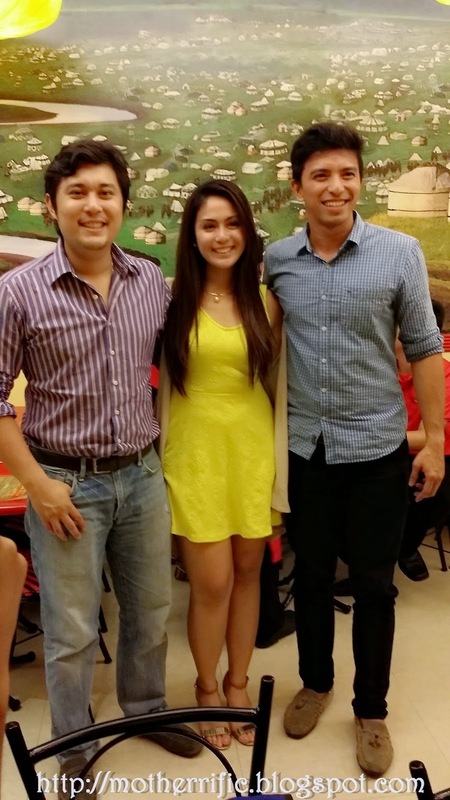 A business built on friendship, young entrepreneurs (from left) Niko Basubas, Celeste Rodriguez, and Jiggy Cañizares, are the people behind Kublai Khan Parkmall Branch. 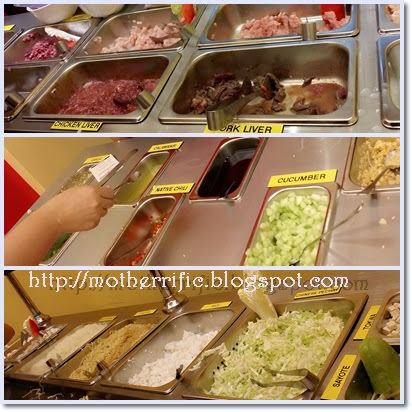 At Kublai Khan, you get to pick your own ingredients from a buffet along with all the sauces and seasonings that you want. 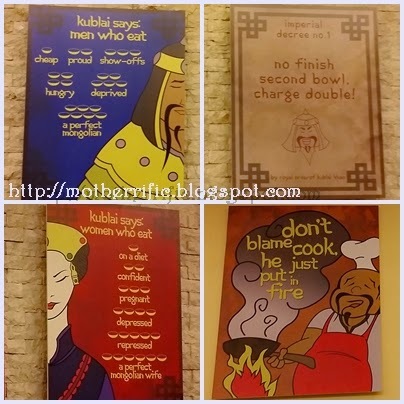 If it's your first time and want to enjoy a real Mongolian food experience, try their classics. Check-A-Bowl - Affordable for only ₱140, this is perfect for those who are not adventurous enough to fill their own bowl at the buffet. You simply choose which ingredients you prefer from a check list and voila your meal is ready! Afraid of messing up your meal or don't know what goes well with each ingredient? Don't worry, they have a board situated near their buffet which serves as a guide. I didn't have the slightest idea on what to put in my bowl. So, what I did was to put all the ingredients that I like without analyzing whether each ingredient will go well with the other. Where's the fun in being so perfect? The color of my mix is not so appetizing. It's a little too pale and the taste turned out to be not so good either but hey what can you expect from a first-timer? You can let their cook adjust the taste if this happens but for me I simply added some soy sauce which really improved the taste. Remember, "Don't blame cook, he just put in fire". Parkmall has become the central hub of Cebu which is strategically located right at the heart of Mandaue City. Schools, hospitals, and different establishments surrounded this mall which makes it a good location for a food business. With a seating capacity of 100 (70 inside; 30 outside), this place will capture the hearts of food lovers from all walks of life. 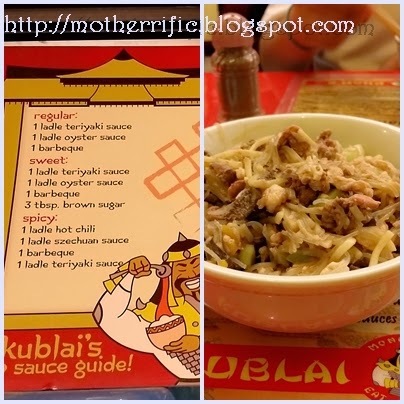 If you're looking for affordability and more value for your money, then Kublai Khan should be one of your top choices. Red always attracts me so added with the soft lighting, the place is cozy but not intimidating. They have interesting boards on their wall which can be an ice-breaker or a conversation-starter when you're on a date. When asked about their future plans, business owners said that they are looking into opening more branches in Cebu and is eyeing on Mactan for their next branch. Sometime in the near future, they might add something different on their menu. Maybe some ice cream, yoghurt, or probably some fruit shakes. This is something I look forward to. I really had a terrific time and my Mongolian food experience is something that I want to repeat (especially when I was given a gift certificate). You may also check out their Facebook page or call Kublai Khan Parkmall at (032) 2369828.
wow i haven't been to any branch of Kublai Khan so far but this looks inviting! 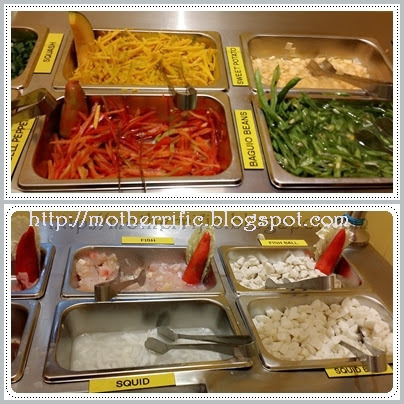 I like to try this Mongolian food. Is it the same as Mongolian rice? Eat-all-you-can-bowl will do for me. Hoping for more branches in Luzon area too. I'd like to try this one! I must remember this when I visit Cebu. I should plan my meals for the day. I'll eat less and get the eat-all-you-can bowl. hehehe I am already day dreaming here. So basically it's Mongolian rice right? I love how the name is of one of Mongolia's most famous historical personalities, Kublai Khan. I hope your next mix would turn out better? This place looks like a lot of fun and the food looks delicious! I have never tried Mongolian food but I can't wait to try! I love Mongolian rice bowls! I hope they open a branch in the South - I'm sure this is going to be a huge hit! I haven't tried eating in a Mongolian restaurant for quite some time. Their bowl can be really delicious once you make a good combination. It's nice to see a place to enjoy Mongolian Cuisine. This look interesting. Perhaps I would try it if I ever visit there. I wonder if they have a branch here in Manila. You are right that the color does not really look too appetizing, but I guess it is because they cook it right there and present it without any garnish. The important thing is the taste. wow i have never eaten mongolian cuisine, it certainly looks interesting! I have tried this.. It is yummy! I hope there will be Kublai Khan in my country. I like to try mongolia cuisine also. I love restaurants of the type Eat-All-You-Can but unfortunately there are no such ones in my city. I would like to have such a feast!